The course starts at Mayor Kinney Civic Plaza, the civic center of Albuquerque. 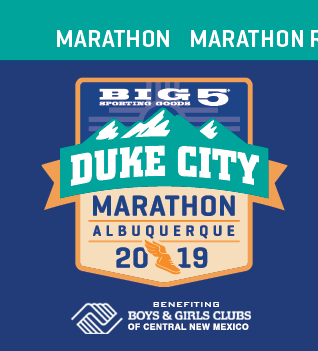 Harry Kinney was Albuquerque's mayor in 1984, and officially started the First Duke City Marathon together with the 15th Duke of Alburquerque (the original Spanish spelling), who travelled from Madrid, Spain, to be on hand for the inaugural event. Running north from Civic Plaza, you then turn left (W) on Roma. 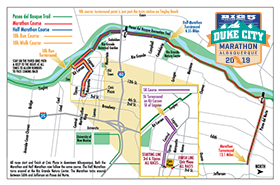 All city streets on the DCM course are closed to vehicular traffic on Sunday, October 21. Just past mile 1 turn left on Laguna Blvd SW and run through the gracious Huning Castle neighborhood where some scenes from Breaking Bad were filmed. Turning left under shady old trees at Kit Carson Park, you might hear the trumpeting of an elephant or scream of monkeys as you near the Albuquerque Biological Park (zoo). At mile 2, runners and walkers access the Paseo del Bosque Trail, within sight of the famous Rio Grande river under the shade of old cottonwood trees. Now it's time to run UNDER historic Route 66 to go north past the Bio Park, featuring botanical gardens and an aquarium. For the next 8 miles you are running a flat course, next to the river on your left and residential areas and horse ranches on your right. At mile 10 you will turn right (E) towards the spectacular Sandia Mountains. After 3.1 miles you will make a U turn and retrace your steps on the Paseo del Bosque Trail, through Huning Castle Neighborhood, Central Ave (Route 66) and back to the finish line at Civic Plaza. 4.8 Miles from Starting Line at 3rd St. and Marquette to Transition #1. Mile 4.8, on the Paseo del Bosque trail intersection with Gabaldon Place, (from Rio Grande Blvd., turn west on Mountain Rd. to Gabaldon Rd. Turn on Gabaldon Dr., under I-40 to Gabaldon Pl. to parking lot at the end of the road. Mile 11, trail parallel to Paseo del Norte Blvd. (heading east). Go north on Rio Grande Blvd. Before crossing over Paseo del Norte Blvd., turn left on gravel road to enter parking lot. Mile 21.4, Same as first transition point. Water station, portable toilets, and official observer at each point. Runners are responsible for own transportation to transition station.